Funded 6,000yen	(About $56.4) The target amount is	$9400	This is an All-In project. Regardless of the target amount, this project will be funded with the amount of money raised. 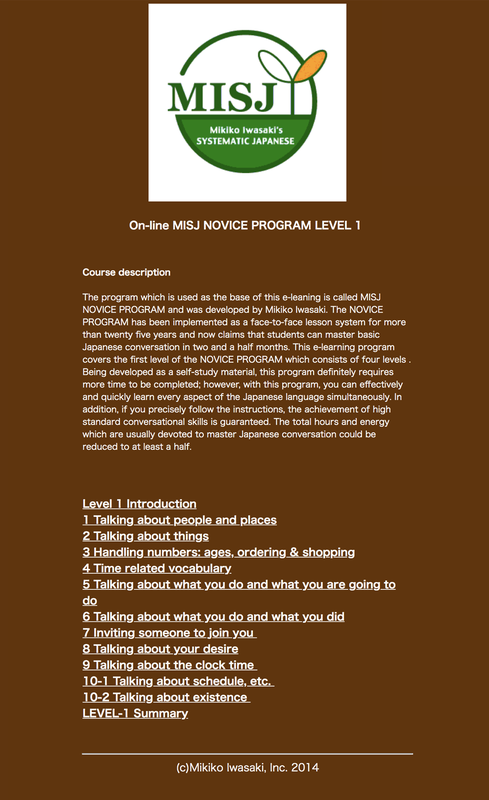 MISJ(Mikiko Iwasaki’s Systematic Japanese) is a groundbreaking Japanese learning method! Created in 1992, it has been used by a number of people all over the world! It focuses on being able to help students produce real communication ability in a short amount of time. MISJ can also be used to make teachers of Japanese in a short amount of time. With an aging population, there will be a shortage of people that are able to work. Therefore it is necessary to bring in people that are able to speak Japanese. To do so, we must first look at fostering learners and helping to increase their skills. With this I am confident in my system’s ability to do better than other systems and methods. With MISJ, a whole collection of people have been able to learn Japanese, and results of this has been amazing! MISJ also have a near 100% satisfactory review rate, with it being seen as Systematic, Effective, Enjoyable, and Recommendable. With 2020 in the forefront of my mind, I am confident that MISJ e-Learning programs are very useful in order to help reach out to the greatest number of people across the world. To continue using these e-Learning programs however, I found that I had to renew those programs to keep up with the current advance of technology, and quite a large amount of work and money are necessary. Thus, I’m looking at using crowdfunding to pay for some part of the costs. I hope that you are able to help me! Thank you for reading and please support me even if it's just a little! Hello! I'm Mikiko Iwasaki director of Iwasaki Language Program Development (ILPD). ILPD is a private organization that I founded in 1992 to provide [MISJ (Mikiko Iwasaki's SYSTEMATIC JAPANESE)] all over the world. MISJ is a groundbreaking Japanese learning and teaching system. Since then, I have been teaching Japanese, training Japanese teachers and making learning/teaching materials. I originally started with teaching Westerners who lived in Tokyo, and training native Japanese speakers as teachers, both in private settings. However, since 2003, I mainly go abroad to teach Asian people as well as to create non-native teachers of Japanese, both in group settings. 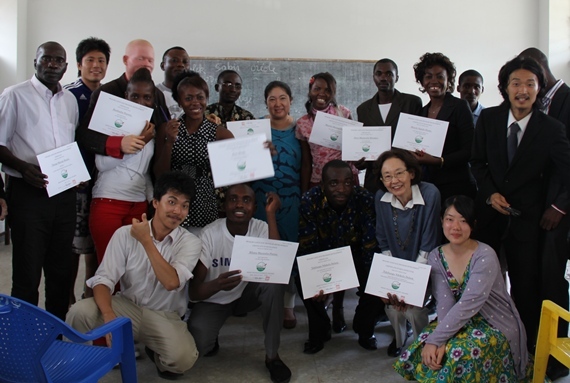 In 2010, with the cooperation of Keio University's Hasebe Lab, I started out teaching Congolese students. Now, Congolese teachers are teaching Japanese there! 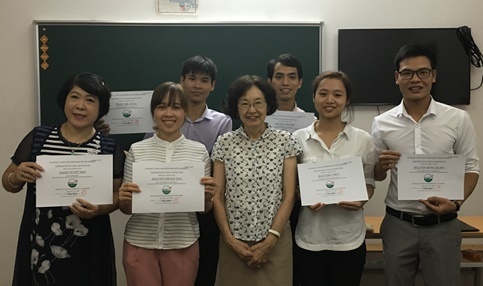 In last December, they succeeded in holding the JLPT in Congo (DRC). In this March, with the support of Japanese Embassy and JICA, the second speech contest was held. Since 1992, nearly a thousand beginners learned Japanese through MISJ without dropping out. I feel that the results speak for themselves! MISJ is a Japanese education system that allows the users to achieve their goals in a fun, fast, and efficient way. As long as the users put a reasonable effort and time into learning, the gains that they can achieve in just a 12 day period is astounding. They can learn basic pronunciation, basic reading and writing of Japanese basic characters (Hiragana and Katakana), and basic grammar for making sentences. Of course they can also enjoy making daily and practical conversations, and even writing essays. If they seriously study for four months, they can learn necessary knowledge of grammar to pass JLPT N4, and will be ready for taking the On the Job Training given in Japanese. It can be said that when it comes to learning not just Japanese but any other language, it is like climbing a mountain. MISJ is the well-maintained route to climb the mountain. As language study requires the process of memorizing a lot of words and expressions, students have to climb up using their own two feet. However, if they select MISJ as their route as well as use the tools that MISJ provides them, they can at least reach to the level where they can enjoy the scenery in half the time. Teachers are the guides. Being a native speaker is not enough for being a good guide. They should learn the very basic knowledge of grammar which native speakers use unconsciously. It is also necessary for the teachers to be able create drills for oral practice without making said drills feel boring. MISJ is probably the only system in the world that can provide everything listed above in a concrete manner. What makes MISJ stand out? It is efficient, effective, and enjoyable. With MISJ, no matter living in Japan or not, students can achieve speaking and writing abilities in just two and a half weeks. It can also develop high quality teachers in short period of time. No matter native or nonnative, people could become able to teach Japanese to beginners in about three months. I started promoting MISJ over 25 years ago hoping to help even just a little with the internationalization of Japan. However I feel that I now hold the keys to helping bring about a better future for Japan. It is evident that Japan will become seriously short of talent as the declining birthrate and elderly population progresses. Therefore we must start to look at and rely on the talents of the foreigners that are coming into Japan. Without doing so Japan will be in crisis. Since every developed country has the same problem as Japan, unless we can win the competition for acquiring human resources, there is no future for Japan. One of the walls we have is Japanese. It is impossible for Japanese people to learn every single language, so we must look at the solution of having foreigners learning Japanese. Even if you leave your job abroad, or if you look to bring in talent from inside the country, having Japanese as a communication tool is indispensable. Especially when it comes to bringing in people domestically, in order to prevent against culture shock as well as creating friction between cultures, I feel there is a great necessity extraordinary beginners’ method in learning Japanese. What we need to cultivate now is not the academic language ability but the language ability which works as a tool in various fields of profession. Thus, what we need now is a Japanese language education system which can quickly and surely develop Japanese speakers of this kind and the teachers who can implement the education system. What brought me to develop MISJ? I first wished to become a Japanese Teacher around the time when Japan's economy was starting to flourish and we saw a large amount of people suddenly have an interest in learning Japanese. Many foreigners then had the idea learning Japanese when they were transferred to Japan on business. But due to the difficulty that many face when learning Japanese, a large number of people gave up quickly. I then had the idea to design and create an original method to make learning Japanese easier and improve this high dropout rate. 1. Learning nearly 100 basic Japanese characters. 2. A lot of sound changes which occur when reading numbers. 3. Unique grammar for making sentences. It took me five years to find out the methods to overcome each difficulty and succeed in establishing the MISJ as the teaching/learning system for beginners. It has been more than 25 years since then. Why create a crowdfunding project? In 2001, I made two e-Learning programs which cover three fifth of MISJ whole programs. It was made using the cutting edge IT technology at that time. However, it is announced that the support of the software will be over in the near future. This means, to continue using these e-Learning programs, I had to renew those programs. To keep up with the advance of technology, I had made small renewals several times. This time I’ve decided to make a big change so that these programs will be less affected by the change of technology environment. To make a big change, I found that quite a large amount of work and money are necessary. Thus, I’m looking at using crowdfunding to pay for some part of the costs. I hope that you are able to help me! Thank you for reading and please support me even if it’s just a little. The money received will be used towards the renewal of the MISJ e-Learning programs. MISJ WELCOME PROGRAM in e-Learning allows the users to access via their pcs and tablets. With this program, students can study Japanese from scratch by themselves to make a solid foundation of Japanese language study. It has text to read explanations, recorded voice to practice orally, pictures and animations to make the study fun, and quizzes & tests to check the level of students’ understanding. In this program, students will learn how to read Japanese basic characters, how to make basic sentences using NOUNS, VERBS and ADJECTIVES, and how to communicate with people using these sentences. This program is ideal not only for beginners but also for those who are not confident in speech and writing. Even the people who have N1 or N2, usually find some new fundamental knowledge of grammar in the MISJ WELCOME PROGRAM. ECC stands for Everyday Check Cards. This program has text and recorded voice. 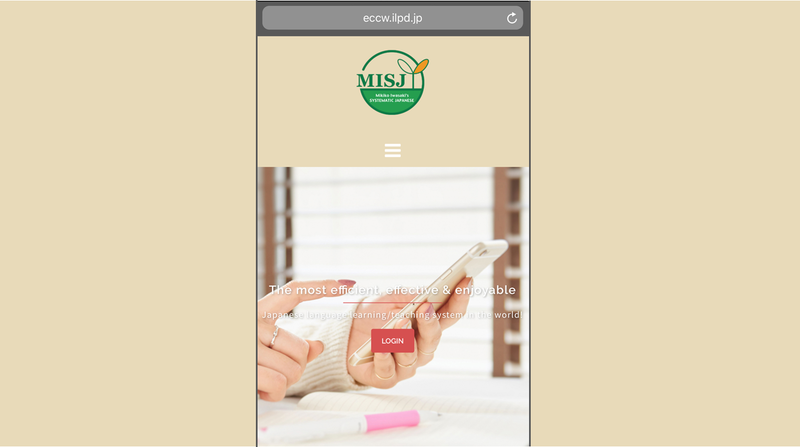 As it allows the users to access via tablets and smart phones, students can revise and test themselves on each lesson provided by MISJ WELCOME PROGRAM on the go. The ECCWeb service is simple to use in three easy steps! You go to the website since in the first picture, enter your details and then choose which section you wish to use! You can also learn more in the how to use section! 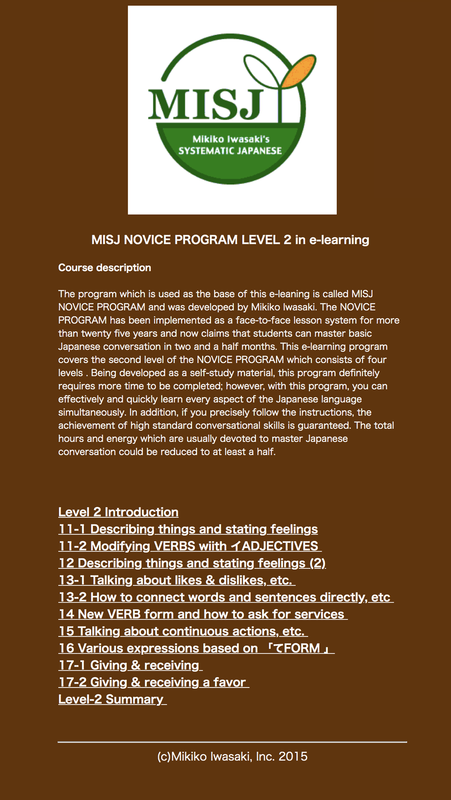 This e-Learning program covers the first level of MISJ NOVICE PROGRAM which follows the WELCOME PROGRAM. 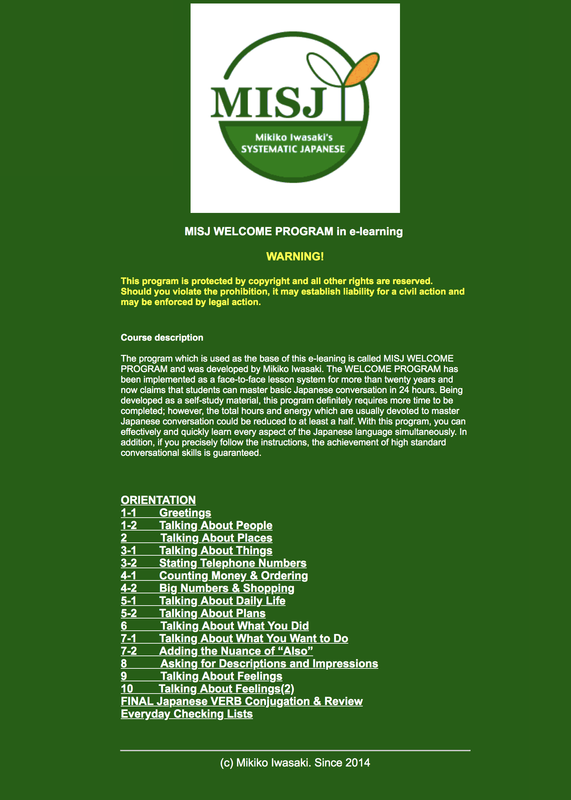 In this program, the topics and situations introduced in the WELCOME PROGRAM are once more introduced in an expanded way. Students can also learn more about handling VERB sentences and VERB-based expressions. The study of how to read Kanji is also included. Kanji is the Chinese origin characters which are used along with Hiragana and Katakana in the Japanese writing system. This e-Learning program covers the second level of MISJ NOVICE PROGRAM. In this program, students can learn more about handling ADJECTIVE sentences and ADJECTIVE-based expressions. Students can also learn how to transform VERBS in “dictionary form” into “te-form.” Then how to make and handle the “te-form” based expressions and VERBS. Be quick and get a discount on getting rights to use both WELCOME PROGRAM and ECC. Be quick and get a discount on getting rights to use both full package of WELCOME PROGRAM and NOVICE PROGRAM 1. Be quick and get a discount on getting rights to use all the materials that have been mentioned. 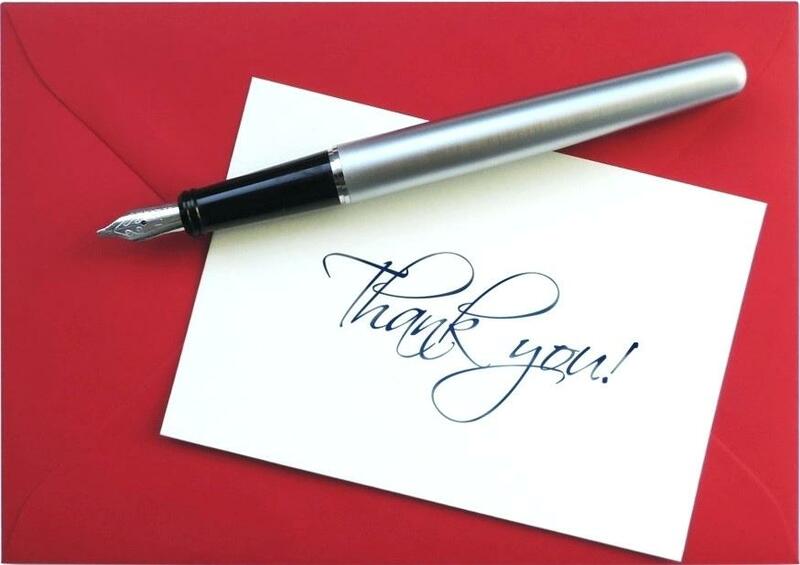 We'll send you a short Thank You mail as appreciation for your help! Suitable to orally revise each lesson. Suitable to start learning Japanese or to re-study the basic knowledge of grammar. Ideal combination for start the Japanese Learning Journey!! Continue the journey up the language mountain with this program. You get access to this NOVICE PROGRAM 1 when its renewal has been completed! Continue the journey up the language mountain with this program. You get access to this NOVICE PROGRAM 2 when its renewal has been completed! By the time you finish learning WELCOME PROGRAM, the renewal of NOVICE PROGRAM 1 should have been completed. You can smoothly continue the journey up the language mountain. Get all the materials that have been mentioned. If you completely master this full package, you can become a natural at daily conversation in Japanese! I will send you 5 accounts with full package of MISJ WELCOME PROGRAM. This will help your employee to improve their speech level or help your students who are not doing well on their study. I will send you 5 full set accounts which allow your employees or students to improve their Japanese language ability dramatically. After having just 10 hours of previous study time, she joined a trial 12 day course for MISJ WELCOME PROGRAM. The level she reached after two weeks and a half was outstanding. You can find a whole collection of recommendation letters here! I think it is now time for methods like MISJ to come to fruition. I hope that many people will come to learn about MISJ and are able to improve their language abilities! A collaborative project with Keio University SFC Yoko Hasebe Lab that started in 2010 is proceeding smoothly. Three Congolese who studied Japanese via MISJ in 2011 were accredited to become MISJ Japanese teachers in 2012. In 2013 three other Congolese who studied Japanese under the original Congolese teachers followed through and got to become Japanese Teachers as well! It was great proof that MISJ works and works in such a short time. Unfortunately it is difficult that the private research work as MISJ to be acknowledged by the academic world, but I got the opportunity to participate in NHK world's broadcast program “Meet & Speak” production from 2011 to 2012. In 2014 I wrote the program text of NHK E-TV. As I am quite confident that MISJ is the best Japanese language teaching and learning system in the world, I hope MISJ carries to spread and help to increase the number of people who can speak Japanese and understand more about Japan and Japanese people. Born in Tokyo. Graduated from Tokyo Women’s Christian College. B.A. in Mathematics. In 1985, she converted from an English-Japanese translator to a Japanese language teacher. 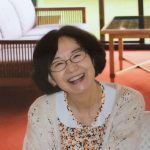 After two years experience of teaching Japanese using commercially available textbooks, she started to create an original teaching system. In 1992, when MISJ was 80% completed, she established Iwasaki Language Program Development (ILPD) to promote MISJ and improve the situation of Japanese language education. Started teacher training while teaching Japanese, developing and making improvements on teaching/leaning materials. 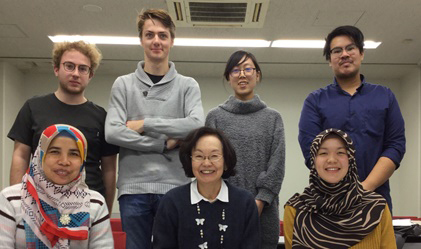 Since 2003, she has been teaching Japanese and making teachers abroad. Be quick and get a discount on getting the rights to use both the ECCWeb program and the e-Learning Welcome Program! Use these to start your Japanese Learning Journey!! We'll start you on your journey and take you half way there, giving you the knowledge and know how to climb your way to the top! You get the full Welcome course as well as the e-Learning Novice 1 course upon completion! Get all the materials that we've mentioned so that you can become a natural at daily conversation in Japanese! You'll get the Welcome course (which is the e-learning welcome program as well as the ECCWeb) as well as both e-learning Novice courses ALL AT A DISCOUNTED COST!!! I'll send you a short Thank You mail as appreciation for your help! Get access to the Everyday Check Cards Web service which is great to revise lessons, or to study by yourself! Get access to the base camp of the Japanese learning mountain as we prepare you with the tools necessary to start climbing! You'll receive just the e-learning Welcome Program which is perfect for the beginning of your journey starting to learn Japanese or reigniting your study of Japanese! Get the rights to use both the ECCWeb program and the e-Learning Welcome Program! With this, you get access to the online Novice 1 course when it has been completed! Complete your journey to daily conversation master with this Novice Course! With this, you get access to the online Novice 2 course when it has been completed! You'll get the Welcome course (which is the e-learning welcome program as well as the ECCWEB) as well as both e-learning Novice courses! We'll send your company 5 accounts with access to the Welcome Course which allows them to improve their Japanese and fit in with the company even easier! We'll send you 5 full set accounts which will allow your student or employee to improve their Japanese language ability dramatically and help them become a more included member of society!